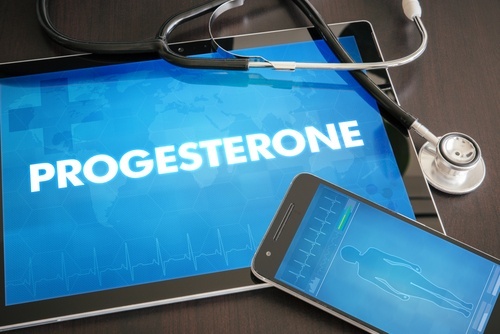 We talk about progesterone probably 100 times a day at Alabama Fertility Specialists (AFS). This hormone is frequently blamed for difficulty in getting pregnant or staying pregnant and is crucial for allowing early implantation to occur. Progesterone happens to be my favorite hormone since pregnancy isn’t possible without it! Progesterone is released from the corpus luteum (a cyst remaining on the ovary after the egg is released) in response to pulsatile stimulation from the brain. The release of progesterone is so pulsatile that blood levels can vary significantly within a short time frame (i.e. 10 to 30), so the specific value isn’t very helpful. A specific duration of progesterone is needed to allow an embryo to implant in the uterus. If you are not releasing an egg (ovulating), progesterone levels are low because there is no corpus luteal cyst making progesterone. If a pregnancy isn’t healthy (ie the DNA of the pregnancy is abnormal), the pregnancy hormone doesn’t stimulate the normal release of progesterone from the ovary and progesterone levels are low.Therefore, low progesterone levels are more a symptom than a cause of a problem. For this reason, Low progesterone levels necessitate further evaluation. When do we give additional progesterone? Certain types of fertility treatment (injections) and conditions (hypothalamic amenorrhea) and occasionally patients with unexplained recurrent pregnancy loss need progesterone supplementation after ovulation. In addition to these reasons, all IVF, invocell and frozen embryo transfer protocols utilize progesterone supplementation. Progesterone is notorious for causing bloating, constipation, breast tenderness, and fatigue. These symptoms make me like progesterone a little less, but the end result of taking progesterone is often a pregnancy! Totally worth it. If you have questions about your progesterone levels or whether you need additional supplementation, make an appointment with one of the physicians at AFS. At Alabama Fertility, we treat all patients with the care and compassion that complex reproductive issues require. We encourage you to ask your doctors and nurses at Alabama Fertility as many questions as you need to in order to find out more.